Google Analytics is a free analytics tool that gathers data about traffic on your site. You can use Google Analytics on a landing page to collect more detailed analytics and better understand your page visitors. In this article, you’ll learn how to add Google Analytics tracking to your landing page. Depending on what laws are applicable to your business, you may be required to notify your page visitors about tracking and allow them to opt out. 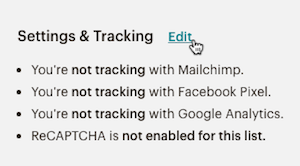 For more information about how your page visitors can opt-out of Track with Google Analytics, take a look at Google’s help articles about data privacy and security. With Google Analytics on your landing page, you can collect information about page views and view the data in your Google Analytics account. 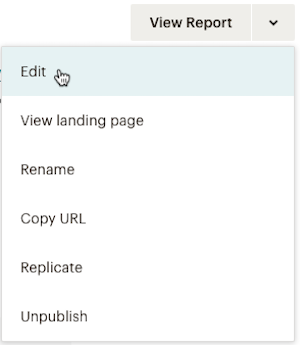 To add Google Analytics tracking to your landing page, you’ll need to input your ID in the Settings & Tracking section of the landing page builder. You can add Google Analytics tracking to a landing page at any time, even if it’s already published. After you’ve turned on tracking, we’ll gather data about page views as people visit your published page and send it to your Google Analytics account. You can find your Google Analytics ID on the Admin page of your Google Analytics account. For step-by-step instructions to find your tracking ID, visit the Google Analytics Help center. If you don’t have an an account, you’ll need to set one up. To add Google Analytics tracking to a landing page, follow these steps. Click the box next to Track with Google Analytics and insert your ID into the Google Analytics ID field. All set! As soon as you publish, we'll start gathering data as people visit and interact with your page on the web. You can view data about your landing page in your Google Analytics account. Here are some other ways you can add tracking to your landing pages. Track with Mailchimp Use our Track with Mailchimp option to collect information about unique visitors and new signups in your landing page report. To learn more, take a look at our article about how to add Mailchimp tracking to a landing page. Learn how to use Track with Mailchimp to gather data about landing page visits and signups.